Beautiful 3/2 Home in the Heart of Matlacha. Walking distance to boutique shopping, restaurants, and live music! 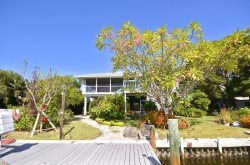 Experience true "Island Time" in this beautifully remodeled 3 bedroom 2 bathroom, waterfront home. Brand new appliances throughout as well as gorgeous granite countertops make this open floor plan truly amazing. Bright colors, and unique artwork add to the eclectic charm of this Matlacha home. The Master Suite boasts a huge walk in closet as well as double vanities, and a large walk in shower. The guest rooms in this property offer plenty of comfy accommodations for all of your guests with a Queen bed in one room and a twin day bed in the other. There is also tons of storage! You are walking distance to all that the artsy community of Matlacha has to offer. Home made Fudge, Seafood Dinners, Boutique Shopping, Live Music, Art Galleries, Classes of all kinds, or perhaps you're just interested in fishing. If that's the case, you really are in the right place! Matlacha Pass, Pine Island Sound, and the other surrounding waterways are known to be some of the worlds richest fishing grounds. You can hire guided trips for off shore fishing, inshore fishing, or even a guided fishing trip via kayak. For those looking to relax, there is no better way than having a glass of wine on the back patio and watching the sky change colors as the sun melts into the gulf. This home has everything you need for the best vacation of your life, all that's missing is you.